I’ve always enjoyed camp, but this year was particularly special because in addition to directing I was actively teaching. With just three interns this year I picked up running the craft portion of camp, which seems irrelevant but serves to focus kids before cooking and give them hands on ways of thinking about the day’s food history and culture before actually preparing the dish. It was inspiring to generate ideas for themes with our interns, who were creative, silly, and hard-working all at the same time. It was inspiring to see what the kids would come up with when given unique tools like okra stamps and paint. Most of all, it was inspiring after 5 years of camp to have a new perspective, one I know will filter into all of our future education programming here at the Museum. 6 weeks, 173 kids ranging from 7-15 years of age, food from the festivals of New Orleans to the mountains of Ethiopia, we had a summer full of adventure and exploration. 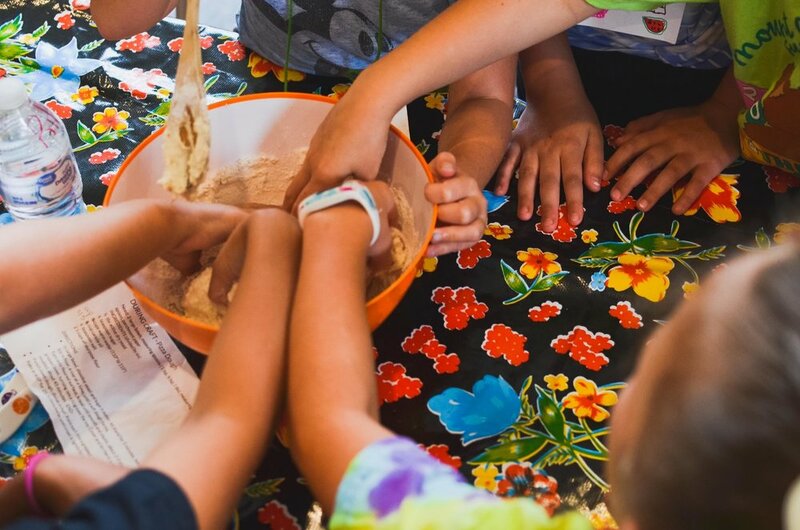 Even though my role in camp was a bit different this year, my favorite part is the same, which is seeing kids push themselves to try new foods. This is where you see them show bravery and take risks, interact with the world and cultures outside their palate; you see them consider something for the first time and come up with an educated conclusion. As an educator, seeing that experience is instant gratification, and this summer was no exception. I can’t wait to see the kids again with our fall Kids in the Kitchen classes and incorporate some of the activities we created this summer implemented next to the cooking lessons. It’s sure to be a semester full of tasty adventures, and as always, I’ll see you in the kitchen!